Eminently readable book on the challenge of change. A little dated. And no index?!! This is an eminently readable book on the the challenge of effecting meaningful and lasting change. According to the author, the path to successful and lasting change is laden with (at least) eight pitfalls, each of which forms a chapter in the book. A ton of common sense pervades the book. For my money, the most enlightening piece is in Chapter 10, on culture (more on that later). However, there are two shortcomings with the book. The first is that it lacks a detailed case study, with specifics, that would make the problem vivid and real. The abundance of anonymized examples do not really help beyond a point. We know they are all based on the author's experiences with real companies, but by making them anonymous we are robbed of the precious insight that reality can provide. They are too short and focused on illustrating the immediate point in question to be of much help. The second is that when reading this book in 2010, the lack of any references to the world of information technology hurts the contemporariness of the book. IBM's change under Lou Gerstner, Microsoft's change to embrace the Internet, Microsoft's subsequent failure in the search business, or the rise of social networking and how established software companies were unable to change to embrace these changes - all examples of successful change or failure to change, and at large, successful corporations. Among all industries, the world of information technology has probably seen the most change over the last two decades. Not having any examples from this industry, to my mind, lessens the impact of this book, in the year 2010. 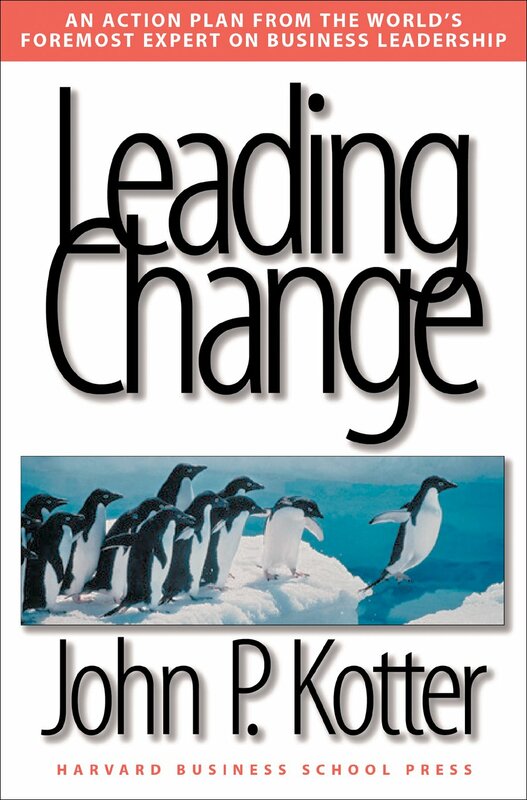 This book is about "leading" change, not "managing" it. The author makes clear this is by design and not accident. "At the beginning, those who attempt to create major change with simple, linear, analytical processes almost always fail. Q: So why would an intelligent person rely too much on simple, linear, analytical processes? A: Because he or she has been taught to manage but not to lead. Management is a set of processes that can keep a complicated system of people and technology running smoothly. ... Leadership is a set of processes that creates organizations in the first place or adapts them to significantly changing circumstances. One of the key points that the author makes is that change has to be communicated often and to the lowest level of a company, and that enough important people of the company are on board with the change. That the naysayers, the skeptics, the cynics, the saboteurs are all out to undo any change that may be effected is not in doubt. The author argues that they need to be engaged with. This is a message that the author repeats in his new book, Buy-In: Saving Your Good Idea from Getting Shot Down . Why change can be difficult to cement is in no small part due to the pervasive influence of culture. And this, in my mind, is one of the most important learnings from the book. Culture refers to norms of behavior and shared values among a group of people. Norms of behavior are common or pervasive ways of acting that are found in a group and that persist because group members tend to behave in ways that teach these practices to new members, rewarding those who fit in and sanctioning those who do not. Shared values are important concerns and goals shared by most of the people in a group that tend to shape group behavior and that often persist over time even when group membership changes. Generally, shared values, which are less apparent but more deeply ingrained in the culture, are more difficult to change than norms of behavior. I would say that this book should not be read in isolation. There are several other books that should be read along with this excellent work by Prof John Kotter. I have railed against the brevity of Jim Collin's latest book, How The Mighty Fall: And Why Some Companies Never Give In , but I think it is a worthy read on what causes companies to fail. And yes, this book has no index. 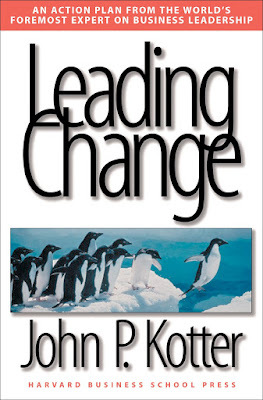 A Harvard Business School title (Leading Change (Hardcover)), and it has no index. That's not change I care for.